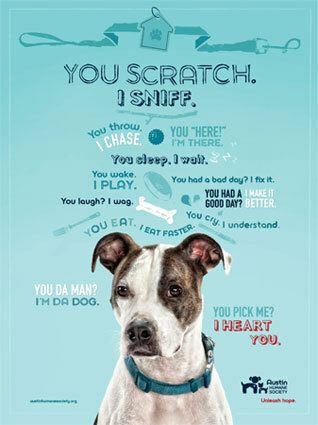 Austin Humane’s Awesome Ad Campaign | Will My Dog Hate Me? As regulars to this blog know, I run two series of pet-related public service announcements, one called Spay & Neuter with a Smile, the other Pet Adoption Videos That Don’t Make Me Want to Kill Myself. Both are inspired by my feeling that serious messages are often best conveyed with humor. Not everyone agrees and I continue to have lively discussions here on what PSAs work and what don’t. Not all humor is created equal. Following two examples of these videos is my interview with Lisa Starr, the Public Relations Manager and a writer for the AHS. There are different philosophies for adoption videos. Some people contend that the sad ones work better; some say the positive ones do. Why did you choose the positive route? Well, from what I’ve been hearing, people don’t like to be sad. They won’t even open an email sometimes if it has a sad message. I can’t tell you how many times people have told me that as soon as they hear the sad Sarah McLaughlin song on the TV they change the channel so they don’t have to see the sad faces of the animals. The Austin Humane Society implements positive messaging whenever possible because we want people to watch the video and see the positive side of what we do. The positive outcomes. Also, the positive videos spread around the airwaves much better than the very sad ones. Are there times when you think negative campaigns are warranted? Absolutely, it’s imperative that people know the suffering that these animals are suffering and the good work that we all do. For our main fundraising event, we put together this one (on Vimeo): It tells both sides of the story which I think is effective. Sad, then happy! Tell us who created the videos on your site and please provide any information about them that might be interesting. In response to my final request for more information about the dogs and cats featured here, Lisa said they were chosen by Door Number 3 and that she thought they came from shelters. So I’m going to contact those folks, tell them how much I love their campaign — I even tear up at the posters, one of which is featured here — and ask them about the pet actors. I’ll make sure they were paid Equity Wages: burgers for the pups, tuna for the kitties. 30% increase in monthly adoptions, year-over-year, as of May 2010. 100% increase in holiday donations, year-over-year. Online donations have nearly doubled since the campaign launched. The new AHS website is being sited as an industry model by the national pet adoption software, PetPoint. Terrific post, Edie. I loved the video of the dog with the “speaker.” But I really loved that you included the results of the campaigns. Great! I’ll check out the Door Number 3 site tonight when I have more time. Very nice campaign by the AHS. I am a fan of clever and humorous advertising of all types. While both types can make a lasting impression in my mind, I somehow feel more “manipulated” by ads that aim for the tear jerker factor. I believe that most of the time we are moved to action when we are shown that positive things can come from those actions vs. just being shown the negative with a plea for help. Thanks for following up — we love our pups here in Austin and appreciate the AHS for all it does! Thank *you* for sending me over to the AHS’s site and alerting me to their cool ad campaign. Heartstring-type advertising may get a lot of people reaching for their wallets through their tears while the ad is running. But like she said, the positive, funny ads are the ones people remember long after and pass on to their friends. Shelters and rescues need all the public awareness they can get. Anything that raises their profile in the community helps. Door Number 3 sounds like such a great organization as well. Putting these together must have been a blast! I can’t make up my mind on which ad I like better! Both are funny, light hearted AND memorable. In the ad world, it’s all about remembering the product name. Fun makes me want to watch. Sarah Mclaughlin makes me cringe and change the channel. I could watch these as feature length movies! I’d even pay the $12 admission! Awesome, their results say it all. The positive video’s DO work a lot better! And… I always want to roll my eyes when I see sad-puppy commercials asking me for money. Blech. But those actually make me want to adopt a dog. ^-^;; Cool. Thanks for sharing. Glad I could share these. It was such a joy to find them — and to discover, via market research, that they are effective in the long and short term. So I’ll be continuing my two positive animal welfare series with renewed vigor, though these are a tough act to follow! Be sure to go to Austin Humane’s site if you haven’t already to see the others — they’re a hoot. I LOVE these! I have a (totally unsubstantiated) theory that the sad commercials play on guilt to squeeze money out of people. But when it comes to bringing a dog into your home, most people are thinking about the welcome at the door, games of fetch and snuggles on the couch. That’s why the fun commercials have a better chance of encouraging adoption. I think your theory is very reasonable; those sad ads do push the guilt buttons, but who wants a depressed animal at home? By the way, I checked your blog — cool pics. You should join the Wordless Wednesday Blog Hop (see my current post). These ads are so great!! Pets can bring so much joy to their owners and that is definitely portrayed in these videos. I am going to show these to everyone at my School for dog trainers service. Thanks for sharing! The Austin Humane Society videos are terrific! They are doing a dynamite job. But I hope rescue groups with less resources aren’t discouraged. It doesn’t always have to be expensive to be effective. Williamson County Regional Animal Service (in the county adjacent to Austin) simply posts on their Facebook page pictures of all the animals that are adopted with their new families. Austin Pets Alive does some of that too. Just to see your neighbors with their new pets, well, you can’t help but smile. And of course, get the idea that if your neighbor is getting a shelter pet, perhaps you should do. These aren’t professionally shot photographs – just snapshots, but still effective in my book, so everyone can do them. You make a great point about the cost of a campaign like this, but I hope the takeaway from this post is mostly that it’s a good idea to keep things positive. The type of heartwarming campaign you describe in Williamson County sounds terrific too. You are right Edie, a touch of humour is the way, because you do remember – great campaign. I love the poster at the top and both of the ads… it does seem to me that the positive ads are going to be more effective at getting people to actually adopt. Who wouldn’t want to be greeted by one of those happy, bouncing, adorable pups every day? It reinforces the message that having a furry friend is fun and will add smiles and love to your life… the sad ads just remind people how much suffering there is in the world, but I’m not sure they actually convince people to adopt an animal. Great post, and I’ll definitely go check out some of the links. Pingback: The Petties, Pee & Papers, Please: What’s Funny? Yea the Austin Humane Society videos are terrific! They are doing a dynamite job. But I hope rescue groups with less resources aren’t discouraged. It doesn’t always have to be expensive to be effective. I totally agree — I’ve been running a series of Pet Adoption Videos That Don’t Make Me Want to Kill Myself and many of them are done on a far lower budget. I just wanted to show that Austin’s great positive plan is very effective — more so than the depressing ones that also cost a lost of money.